In the past we read about things in books, but seldom had access to the source material. As a result we only had access to the things that others chose. Now that things have been digitized we have access to everything. We can find old photos that have personal interest to us rather than an author. Now, people have the ability to interact with historical documents and photos. www.shorpy.com is a blog with photos from historical archives. Library of Congress on Flickr – People make comments on the photos. Members of the Community add tags. Interesting example of how people add tags. Ordinary pictures of ordinary things – show a way of life and become nostalgic. Movies: For the Living – Prelinger Archives: 1949 television production from the City of New York – a Public Service film about the housing problem in NYC. A way for us to see everyday life – without being filtered through a scholar. The Living Room Candidate – presidential commercials 1952-2008. The Future of History:There will be more of it. More complex written record – e-mail, blogging, wikis, social networking, etc…What happens when we die? Digital Dark Ages? People are interested in history, but not as passive consumers: Comments, conversation and stories. Contributions and crowdsourcing add to what we know. We want to encourage users to share their own photos, home movies, memories and mores, even though it means giving up control. Encourage people to use your material and create new tools…even though it means giving up some control. Library 2.0 tools you can implement in your catalog or on your website to engage your patrons and make them want to come back. Library 2.0 is making your library’s space more interactive, collaborative, and driven by community needs…to get people back into the library by making the library relevant to what they want and need in their daily lives. Today’s teens are looking for collaborative content. 80% of requests for materials are coming from people’s homes. In the beginning, libraries had the information and pushed it out. Now people are talking back. Catalogs should be: Attractive – keep up with current web “fashion”; Fun – patrons should enjoy searching and finding; Friendly – easy to link into and out of your catalog; Engaging – make patrons want to fome back over and over again. Let user’s participate: tagging, ratings, reviews – we still have the same content, but now users have some participation. Tagging: Why do people tag? So they can find it later. For an example – see Ann Arbor District Library (www.aadl.org). Tagging allows people to stay on your website longer. Darien Library – has a tag cloud on the right – tags can be searched. Also www.LibraryThing.com allows people to tag their books in their collections. Some libraries are embedding this into their catalog. Makes it easier to find similar books. Ratings: Allows people to rate the items in your catalog. In some cases reviews are allowed. This allows other patrons to see what other readers think about a book before deciding to read it. Some libraries call them comments. Most comments and reviews are moderated. Also, people need to log in in order to post comments. 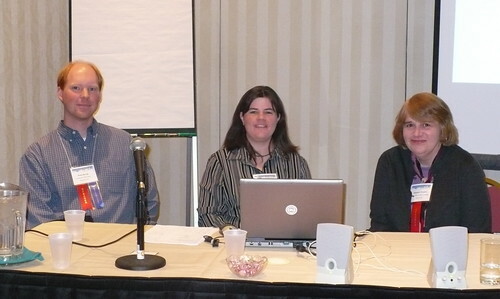 Help users when and where they need it: Live chat enables librarians to help users. Meebo widget allows IM chatting – put it on catalog page to give users the option of asking a live person for assistance. Some libraries put this on their main page. Find it now, save it for later: Text call numbers to them (look into how to do this – Paige didn’t have specific information), download citations from the OPAC (OCLC has this on WorldCat), bookmarking – save URL as a bookmark on a socail bookmarking site. A way to gather wish lists and bibliographies. Allows people to organize the library collection the way they want. How to make our websites better by focusing on our local patrons. embed photo from flickr.com: Once logged into flickr, click on size. Flickr then has html code already prepared. Copy, then paste into the source code for your website. Flickr does not format the photo, so you would have to do that. Photo Badge from flickr.com – this is a tool on the bottom of each Flickr badge. Click on this – either html or flash (html works best for most users), then follow directions for this. Choose what will be in your badge, then choose how to format the badge. Then copy html code, go to web editor and paste it in. Bookmarks Feed from delicious.com: Must have account with these services. Click on settings. Go to Linkrolls to set up how you want it to look on your website. As you do this it automatically gives you the html code which you copy then paste into your website source code. There was much more, but it’s difficult to write it in a coherent fashion – much of what was discussed was actually shown, not told. Check the NELA website where the presenters will be posting much of their presentations. Hello, I’m Brian Herzog, Head of Reference at the Chelmsford (MA) Public Library, and this will be my second NELA annual conference. I’ve never been an official blogger before, but I’ve been posting my session notes for all the conferences I attend on my own weblog. I’ll be at the conference all day Monday and Tuesday (probably going to see the Hollywood Librarian Monday night). I’m looking forward to meeting everyone, so please come up and say hi if you see me.